I had to go out yesterday and get a new iron. I like to iron in the family room in order to keep an eye and ear out for everyone. I can't leave it all there though so end up just picking everything up, still on the ironing board, and moving it back to the study/sewing room. Every so often, the iron goes suicidal and jumps right off. DH is worried about the hardwood floors, I'm just sad that I keep killing irons. So with my new iron and a cart full of groceries, I came home to try again. The quilt seemed smallish to me, so I laid it out in the formal living room which holds a piano, bookshelves and my quilt blocks. 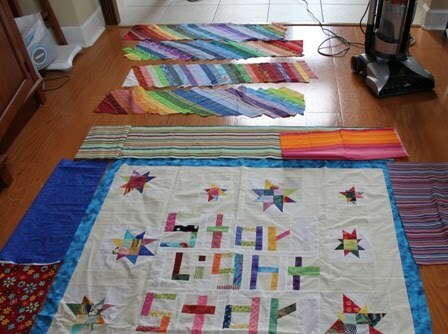 Sure enough, when measured, it wasn't anywhere close to the twin sized quilt I was shooting for. I had a few extra blocks and more in the works, so I spent the afternoon working those through and adding them to the quilt. I used up all my 1.5 inch strips and still don't have quite enough. I think I need 8 more to get the size I was going for. What to do? What to do? The scrap basket is overflowing again. 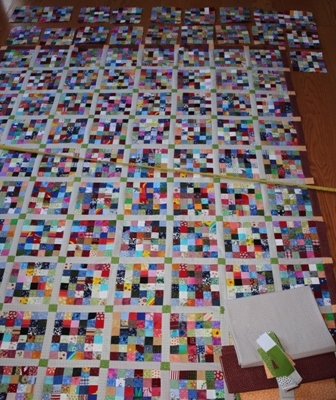 An afternoon sorting all that out and trimming to size would surely yield plenty of strips to finish the quilt. That would be the smart way to go. A quick peek at the blogs though, yields other temptations.There are Amy's Block of the Months, all up on the wall reminding me that I should take a peek at mine. I did use Christmas fabric after all, and that time of year is growing near. I've made two quilts now with the Irish Chain blocks in between. One was already gifted, but I pulled the other out to remind myself how many blocks. Twilight is a good size for snuggling on the couch and has kept me warm on many an evening. 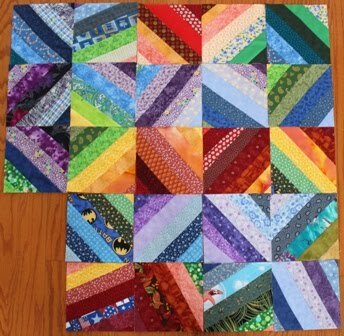 10 blocks with 10 alternate squares and a good sized border. A little sorting and arranging yields two quilts. It wouldn't take long to use the extra fabrics to make in between blocks. That would be a nice afternoons work. Wait a minute, I was going to finish off the postage stamps, wasn't I? 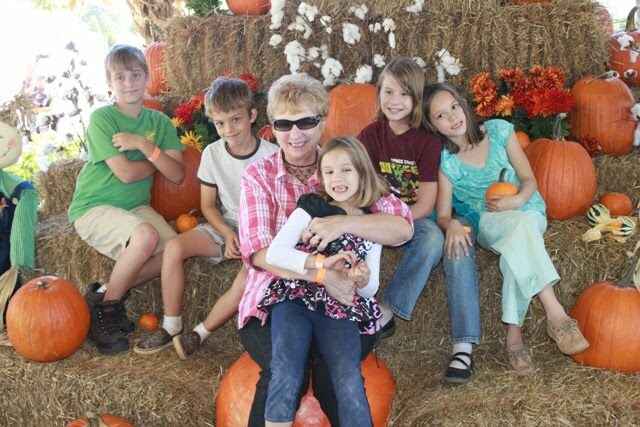 It's Halloween and the kids all want to go decorate and carve pumpkins. It's Sunday and laundry is calling my name. I guess I should just stop spinning around, pick a direction and go forward. 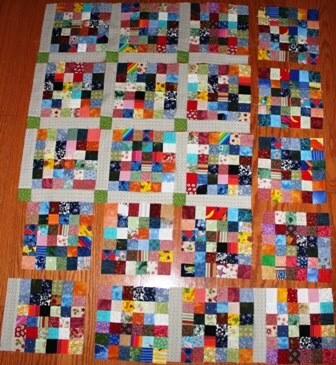 The blocks for the Postage Stamp quilt are together along with border number 1. I know I will also add a green border, but I haven't decided yet if that will be the only one. It needs a bunch of ironing of course, before the bordering can begin, so I think I'll just let it hang up outside for a while being admired. The funny shadows are from the pool screen as it filters out the evening sun. Ryan and I are going to a mother son dance at school tonight. It has a Star Wars theme. 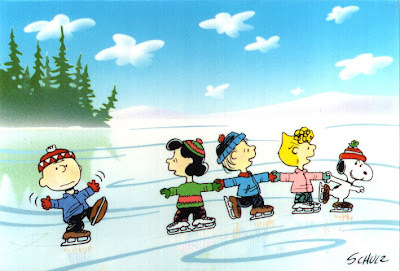 Kurt is taking the girls to ice skating at the same time and then we can begin the usual weekend round of skating, football, and OM. 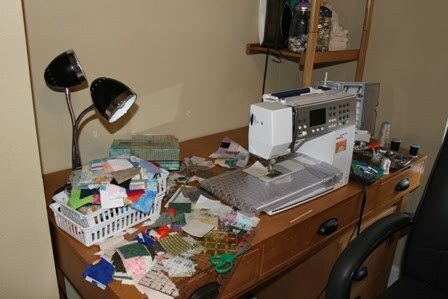 I'm sure I'll steal some time with my sewing machine somewhere in all of that. Almost sure anyway. ....being called away to answer the phone and returning to a jumble of postage stamp blocks being worked into a flimsy. It was a busy day and I didn't think I had energy for much more than a bit on mindless TV viewing until it was late enough to call it a day. I was recording two Halloween specials for the kids though, and the DVR does not let you watch a different show while it recording two others. Yes, I could have gone to another room to vegetate, but I didn't. Instead I sat down to work a few more rows through the machine. As I'm sewing, I'm looking at the fabrics and remembering where they went when they were new. Everything in here has been part of something in the past. Somehow it's all come together in this improbable collection of tiny little bits. What could be better than that? I was all excited yesterday to finally have a Monday night off from Academic Team. 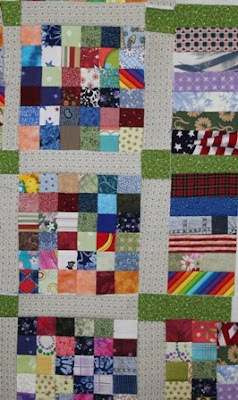 I checked the website for our local quilt guild which has a "circle" that meets on Mondays. 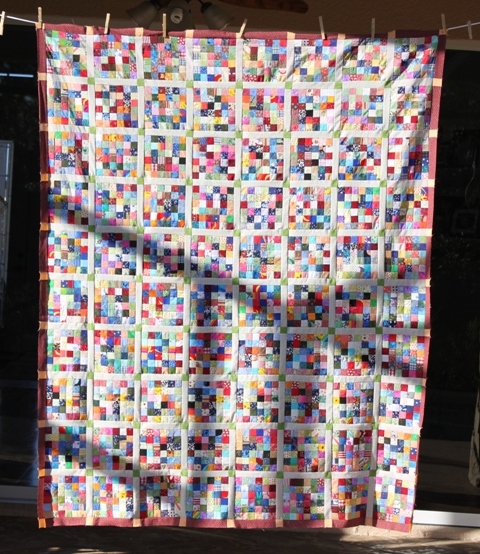 I keep thinking it would be fun to join up with some local quilters and get involved in the quilt scene in my own community. So I dashed out the door as soon as Kurt was in and trekked over the causeway to the library where the meeting was supposed to be. The meeting room was dark, empty, locked. Maybe they changed their meeting date and time. Maybe they didn't update the website. 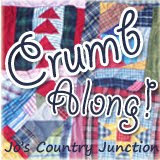 Maybe I'm just not meant to find local quilting folks. 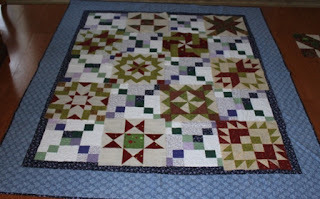 So, no meeting, and no time for quilting yesterday. I made up for it tonight though. There was time this afternoon to work more postage stamp blocks through the system and find some suitable substitute sashing fabric. I moved to the floor after I outgrew the design wall. 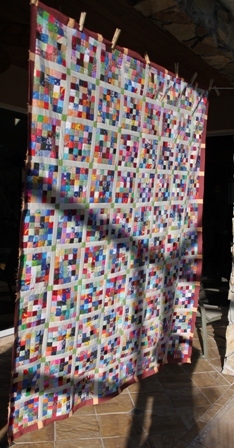 Now I just have to attach the new sashing strips and I can get it pinned into rows and settled in next to the machine. 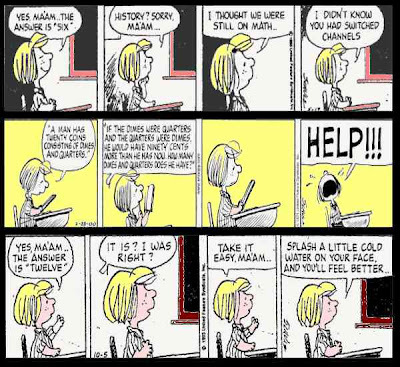 I'm still pondering the outer row of darker strips, so I'll save that part for last. 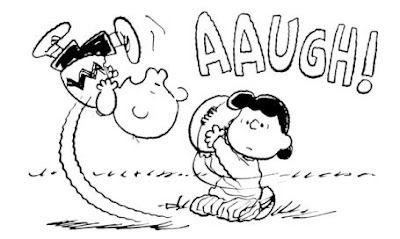 There won't be much time tomorrow, we're getting the house refinanced and a notary is coming over in the evening with the closing papers to sign. Who knew that notaries made house calls? There is also football practice. I think Thursday Kurt in entertaining clients and Friday is probably ice skating again. 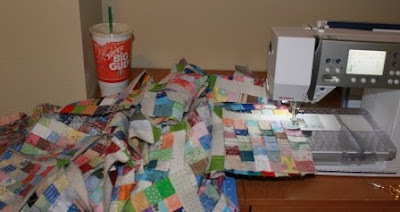 Maybe Kurt will take pity on me and let me hide away for part of the weekend and sew. He's going out of town next week and usually tries to make sure I have a little alone time before he abandons me. 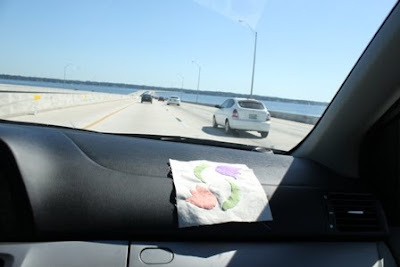 Yesterday Anna and I went to St. Augustine with a friend of mine whose daughter is also a friend of hers. My friend has volunteered to plan the leader daughter camping trip for Girl Scouts this year and wanted to check out the camping sites and get the plans firmed up. Anna and I went along for company and moral support. We did some walking through the historic downtown while we were there and visited the oldest school along with Anna's favorite candy store. Then we walked through the campground and found places for the catered dinner and the campfire. It is a beautiful facility, and it should be a really nice weekend. Today I had some time to work on the postage stamp blocks that I have been using to try to whittle down the 1.5 inch strip drawer. 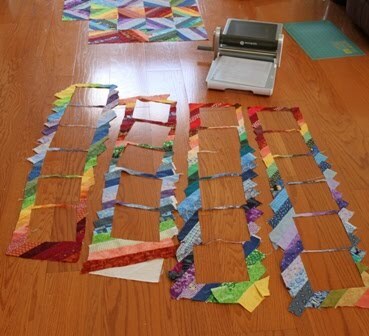 I am out of the light colored sashing strips and so need to make some design decisions. I had originally planned to make it twin sized, just because that is my default size if I don't have a specific function in mind for a quilt. To grow that big it would need two more rows of blocks all the way around. I considered switching to another similarly colored sashing strip for the next two rounds before adding a border of the green. I also thought about swapping out the light and dark colored separating strips to make the last couple of rounds a little more border like. Kurt thinks it should just be a smaller quilt. He wants me to take off the outer sashing strips and replace them with a wider band of the green. I thought instead that I might cut more of the strip sets into a wider band and use that as the border. I might also surround the top with half blocks that are 6 by 3 instead of 6 by 6. I guess I could also try to get some more of the light colored fabric. It came from Connecting Threads and they might still have more to order. I'm not sure yet which way I'll go, but I guess I'll let it sit up on the wall and see which one calls out to me in the morning. What do y'all think? 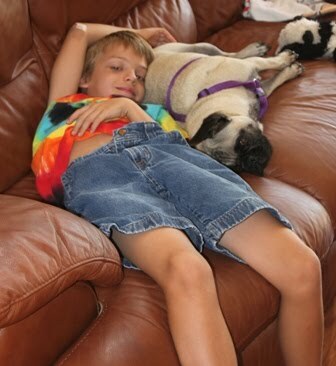 Here is Ryan hanging out with Lizzie this morning. Lizzie seems to like it when the kids use her as a pillow. Or when she can use them as a pillow. I guess either is good for her. 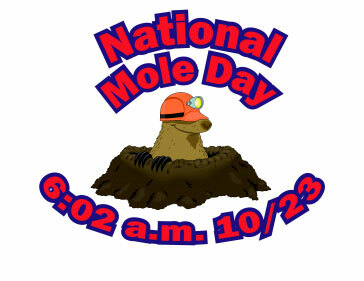 For everyone that doesn't teach or take high school Chemistry, today is mole day! At 6:02 a.m. we began our celebration of Avogadro and his number which allows for the conversion of grams to atoms or molecules. After the Mole Day fun, we had a signing ceremony for one of my students who is going on to play basketball at the college level next year. He gave a moving speech where he thanked his teammates and his mom and left us all choked up in the audience. I have still been going to Anna's school on Friday afternoons to do science labs. Today was physical and chemical changes. Then Ryan had tryouts for Lego Robotics after school and I stayed to help out with that. By the time I got home at the end of the day I was done. I can't remember the last time I took a nap, but it sure felt good. 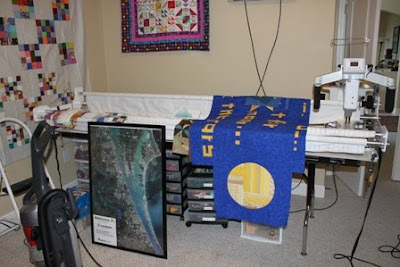 While I didn't have a lot of motivation to sit at the sewing machine tonight, I did pull out my Elm Creek Quilt to work on a bit of hand quilting while watching a movie with the kids. Kurt was kind enough to take Anna to her ice skating practice, and I was happy to have a bit of time to relax. 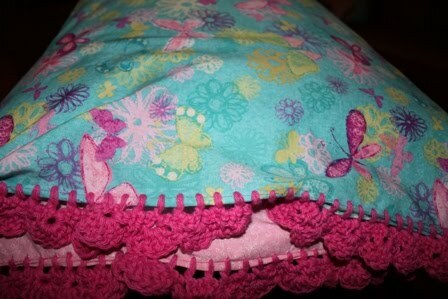 I try to take those decorative pictures of finished my projects, the ones that look all pretty and inviting. Instead they just end up looking like regular stuff. So here is Sydney's pillow. I think the yarn I used was fatter than the yarn in the pattern. Maybe next time I'll just adjust the pattern. I do try to follow the pattern the first time through though. That way if it doesn't work out I know who to blame. Everyone is just now home from football practice and getting ready for bed. 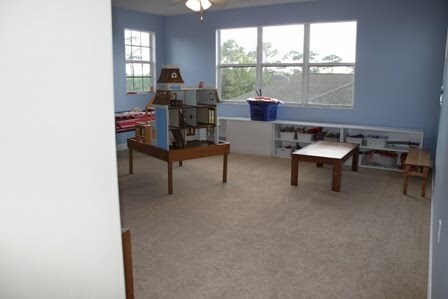 I may sneak into the sewing room for a few minutes after they are settled in. After I write a chemistry test for tomorrow, and tidy up the house a bit, and finish up that last load of laundry. Well, maybe not tonight. The new fabric I bought Monday had worked it's way through the laundry cycle by this afternoon so I took few minutes to get it ironed, trimmed and settled into my stash. Most of these are for midget blocks, but I loved the butterflies and thought I might use them as an inspiration to help Sydney choose a new theme for her room. 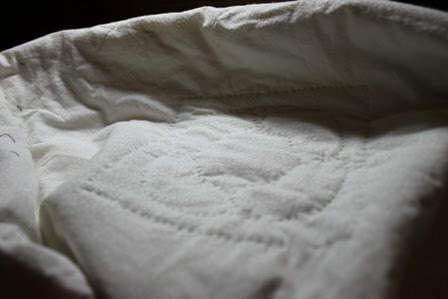 It's an continuous process of introducing fabric to go with new and ongoing projects while trying to creatively blend in the extras and work them through the system to produce finished quilts. While I love the quilts that come from perfectly matched and coordinated lines of fabric, It's much more fun to collect little bits and pieces along the way. I had seen a tutorial for crocheted pillowcases a while ago on You Go Girl! and had been saving it in the back of my mind. 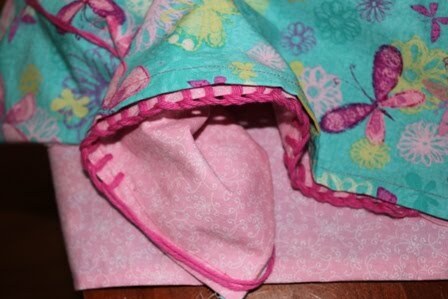 So before the kids hopped off the bus this afternoon I put one of those together with the butterfly fabric and started to work on the blanket stitch edges. I would have finished it off, but the kids got report cards today and wanted to go to Krispy Creme. They heard a rumor that they could get a free doughnut for every A. Can you believe that they got 6 free donuts each and wouldn't share a single one with me? The machine was very cool to watch and kept them all fascinated for ages. So, this morning I popped my oatmeal into the microwave. I like to use a mug instead of a bowl because it's easier to carry. When I came back to check on it, it had boiled and exploded over the edge. I grabbed the camera, because I thought it was a funny sight. The kids guessed immediately that I was going to put a picture up on my blog. They thought it was a strange thing to do, but still knew immediately what I was up to. Sometimes when I read other peoples blogs they seem so polished and professional. It's a little intimidating to think about the shiny perfection that they portray. 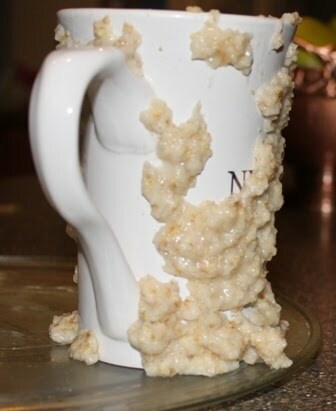 My life doesn't look like that at all, mine looks more like an exploded bowl of oatmeal. Yesterday was another busy day. We had a make-up lesson for ice skating which overlapped with an academic team match. Kurt and I did the kid swap which allowed me just enough time to pop into Hobby Lobby on the way to the competition. I got home just in time to head to bed so I could start all over again today. Today was a better day. I don't have to go to the meetings that happen on the third Tuesdays after school, so I took advantage of the extra free time to do a little sewing. I decided to swap out the sashing strips on the postage stamp blocks and go for a more uniform look. Initially I envisioned a white on white strip, but it seemed too stark. I'm still not sure about the green, but I'll let it simmer and see what I think in the light of day. The design wall hasn't made it back up again after the new carpet, so I'll let the floor do the work for today. I am starting to notice a visible difference in the 1.5 inch strip drawer. I wonder how many more blocks I can make before they are gone? 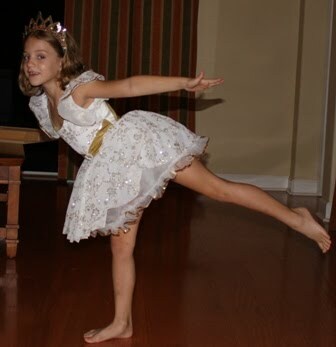 Sydney got one of her costumes for the holiday show. I made her promise not to wear it around the house until after the performance, but she did ask permission to try it on before putting it away. The kids swam this afternoon. I had to turn on the hot tub for them because the solar heater sprang a leak last week. It has actually been quite fall-like lately, at least by Florida standards. 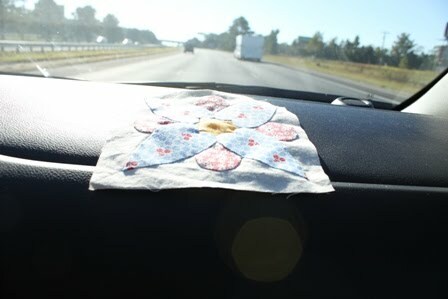 Before we took off for our 14 hours of driving this weekend, I had the sense to grab a couple of applique blocks and throw them into a bag on the way out the door. In a perfect world I would have spent a couple of hours getting everything prepped and ready, but at least I had the raw materials to make a little handwork possible. With the midget blocks all sorted into tidy little page protectors, it was a fairly simple procedure to thumb through until some likely candidates appeared. Not much was accomplished on the way north on Thursday night. Thursday was quite a day and I was happy enough to spend some time catching up and chatting with the family. Kurt and I started talking about work and life and politics and before I knew it we were pulling into the driveway at midnight. I did manage to steal a few minutes away over the weekend to do a little ironing and cutting so I could get something done on the way home. The kids were pretty well zoncked after a weekend of fun with their cousins, allowing me to get quite a bit done. Blocks 38 and 56 got appliqued and block 58 was started. Block 58 is a little crazy. I had a little trouble getting the shapes even and the fabric attached, but I'm determined to make this little block anyway. 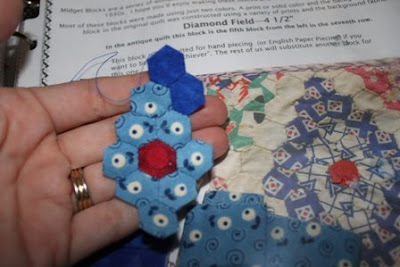 Each hexagon finishes at about half an inch and there seem to be about 70 of them in the block. I think I'll end up appliqueing the medallion onto a background square. The picture of the original seems to have just chopped off the extra blocks around the edges and I can't quite bring myself to do that. It was a picture perfect weekend at Noanies house. 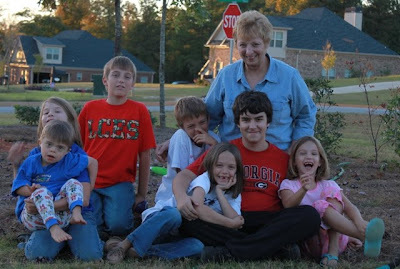 Friday was a teacher workday, so we all took off for Georgia to visit with the family. It is rare to be able to get all the cousins together in one place these days. They still play so well together. I wish they lived closer so we could spend more time together. 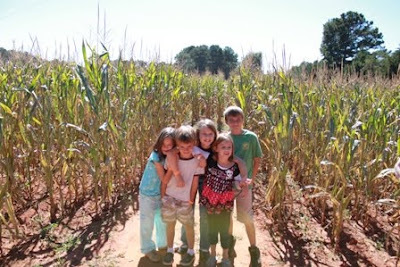 On Saturday we all went to a Maize Maze. The weather was absolutely beautiful. Crisp and cool in the morning and then balmy and sunny all afternoon. We all had a blast winding our way through the corn looking for stamps and a way out. Austin and Ryan led one group while Paige and Sydney took charge of the second. We had a couple of people sneak out before the end, but with a little help from some helpful kids along the way, we all found our way out again. We were up bright and early this morning to make it back home before Ryan's football game this afternoon. 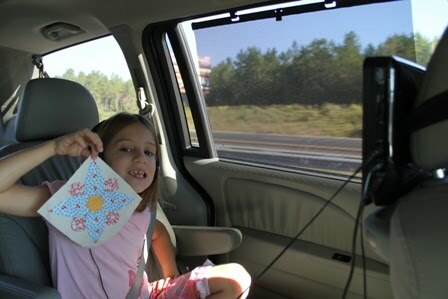 I'll put up another blog entry with the sewing that I got done in the car on the way home. I can be very productive for a while. Then something happens to knock the train off the tracks and I just sort of shut down. I think Sydney getting sick did that for me this time. She is all better again, bouncing right back up into happy hyper mode with the resilience of childhood. There have technically been a few times in the past couple of weeks when I might have sewn, but I could never quite muster up the energy. Ice skating is followed by football and scouts which sneaks in around work and then the cycle starts over again. All good stuff, but it just keeps on coming. Tonight I'm going to a meeting about science fair at the kids school while Kurt is off coaching Ryan's flag football team. Tomorrow is my shining star of a day. Parent conferences at work which they had spread past my regular work hours and had to reschedule. I usually teach science in Anna's class on Fridays, but there is no school this Friday so I'm doing it a day early. That is followed by my turn to lead Girl Scouts which happens at the same time as the organizational Lego Robotics meeting. If I'm still upright and coherent when all that is done it will be just short of miraculous. But yeah, it's a long weekend from school so that is a very good thing. 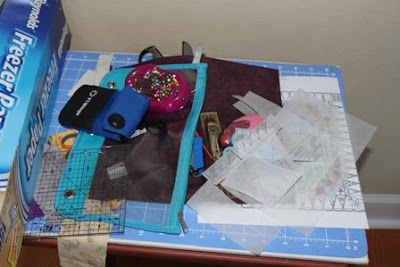 I'm hoping for some calm time with my sewing machine next week. I browsed the new Keepsake quilting magazine while administering the PSAT this morning and found a few inspirations along the way. 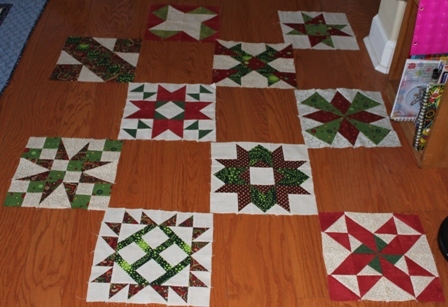 There was a beautiful poinsettia quilt on the front that I'm seriously considering. 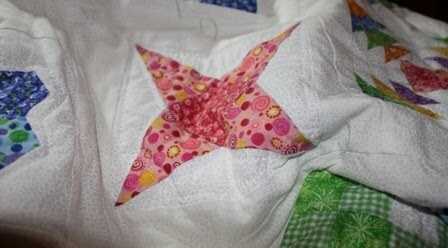 Applique is nice as a carry along project, especially if it isn't too complicated. Sydney stayed home from school on Friday with a sore throat and fever. It was, conveniently, Kurt's day off, so he got to stay home with her. She wasn't acting any better by today and so I peeked at her tonsils. Oh my, I'm no doctor, but it sure looked like strep throat to me. Off we trotted to the urgent care clinic where the rapid strep test came back positive. I'm glad we didn't wait for our regular doctor to open up again on Monday. Hopefully by then the antibiotics will have kicked in and she'll feel well enough to go back to school. Kurt's gone off camping with Ryan and the Cub Scouts. 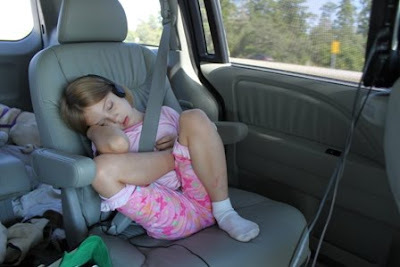 Anna is supposed to be resting before her Girl Scout lock-in tonight. 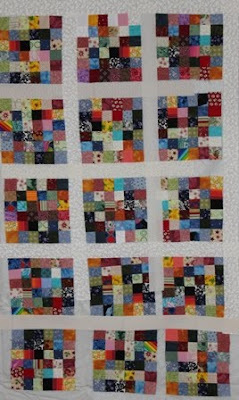 With a bit of time before anything needs to be done again, I might even pop into the study and sew a few blocks together for my postage stamp quilt. You know that smell that a new car has? The artificial chemical smell that shouldn't be so delicious, but makes you think lots of good thoughts? My whole house smells like that. Now I have a huge urge to go and clean everything to make sure it looks as good as it smells. Instead I'm overloaded with lots of other stuff that has to be done. The quarter ends tomorrow, so everything has to be graded. I'm that annoying teacher giving a test on the last day of the quarter, so I have to write that before morning. This weekend is packed, all with good stuff, but still booked solid. Tomorrow is my day to teach science to Anna's class. Ryan and Kurt are doing Cub Scout camping. Saturday there is a Girl Scout mall lock-in. Sunday is football, OM and ice skating. I think that's all. I'm trying not to think about it. The air has taken on a definite tinge of fall. There is a little nip in the air that makes you think it might be nice to have a jacket in the morning, but the afternoons are crisp and bright. 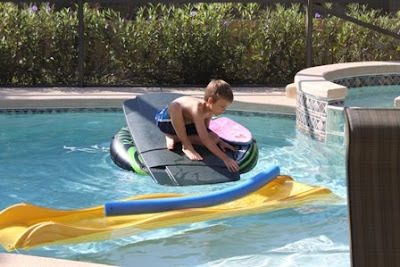 We sent Ryan out to get the toys out of the pool, but he didn't want to get wet. Instead he built himself a little boat and paddled around shoving everything to the side. The new carpet is in. Now the house just needs to be put back together again. I spent a lot of time before cleaning and touching up paint. 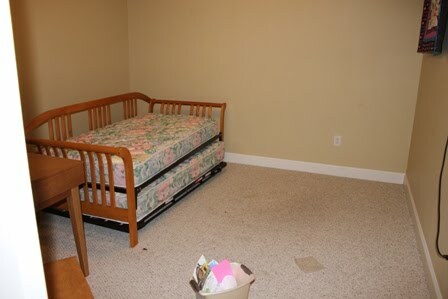 I've got the beds made, but the closets are going to require some work. 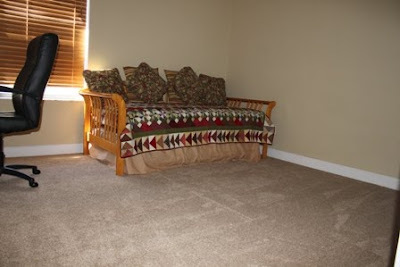 Now with the new carpet, it all looks fresh and clean. 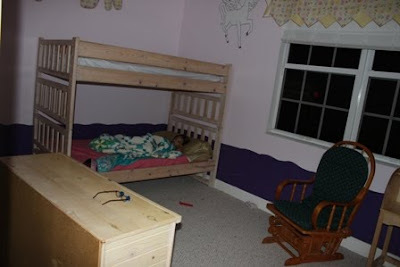 The upstairs was done yesterday, so the kids could sleep all snug in their own beds. So here I sit, drinking a Diet Dew and taking a deep breath before I jump in and get started again. It is so much fun having two design walls to play with. Really it is just another excuse for trying to have too many irons in the fire. I'm OK with that though. 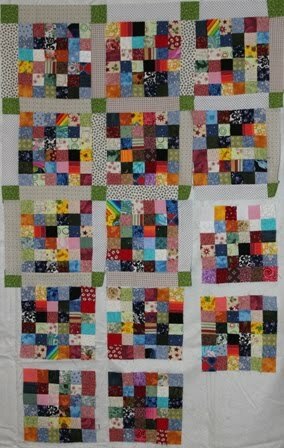 As soon as I had Tic-Tac-Toe down and sewn I decided to put my Midget Blocks up and see how they looked all together. 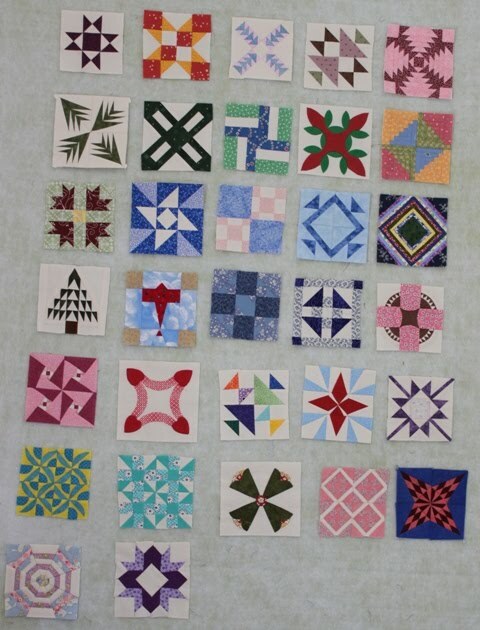 I am thinking about sashing them with a tilted background like the Elm Creek quilt that I did two years ago. 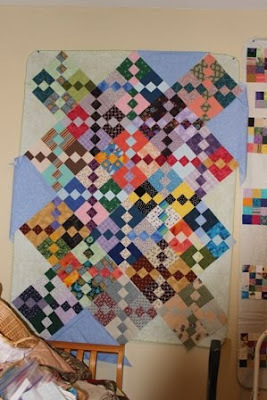 I had the same sizing issues on that quilt when switching back and forth between paper and traditional piecing. It's harder to tell that the sizes are not all identical when the blocks are floating in a little sea of white. 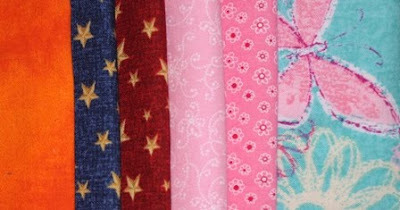 I've been saving a 2 inch block of each fabric, so I'd also like to work that into the design somehow. On the other design wall are the postage stamp blocks that I whipped up last night in order to get the 1.5 inch strip drawer to close. I've still got another batch in the works, but you will all be happy to know that I decreased the volume of strips to the point that I could squish in the basket holding 1.5 inch squares. Lizzie wanted to help with all the strip piecing and managed to come in and make herself at home right after I accidentally spilled the drawer. Then Sydney came in this evening and helped match up strips by size. She is quite a nice helper to have in the sewing room. 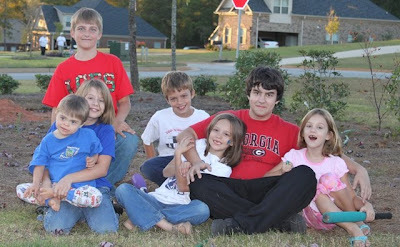 Ryan had a football game this afternoon and Anna had a cookout with her Girl Scout troop. I went out shopping this morning and got exciting things like wooden hangers and a cutting board as well as some border fabric for Starlight. New carpet is coming the day after tomorrow so everything is a bit torn apart right now. Tomorrow night in Academic Team, but maybe I can find some time in the afternoon to finish clearing out the study. I've wanted to keep it functional for as long as possible, but it will probably have to be put away until the weekend comes again. While trying to put things away today I wanted to put 1.5 inch squares into the same drawer as the 1.5 inch strips. Makes sense, right? But I couldn't get the drawer closed again. When a drawer doesn't close, it is officially time to use some up to make it fit. So after the kids were settled all snug in their beds I started sewing 1.5 inch strips together randomly. They ended up as these little 36 patches that will finish up at 6 inches square. I only meant to sew for a little while, but there was an Iowa game on TV. Football games sure do last a long time. I loved the idea of a cool string border for my quilt better than the reality. I can't bear to waste the string fabric though, so into blocks they must go. It took less than 20 minutes to whip out 23 6.5 inch string blocks. I'll throw them in with my 6.5 inch crumb blocks and eventually there will be enough to grow into a quilt. How cute do those look all laid out together? 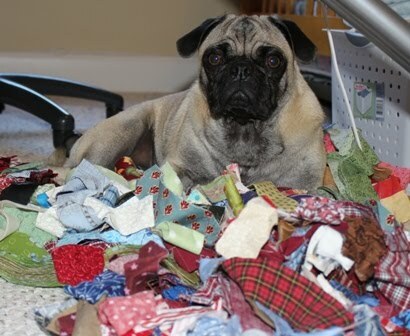 Maybe next time one of the strip bins gets too full I'll have a string sewing day. I was so good at working on UFOs last year. One a month like clockwork. I felt virtuous and content. 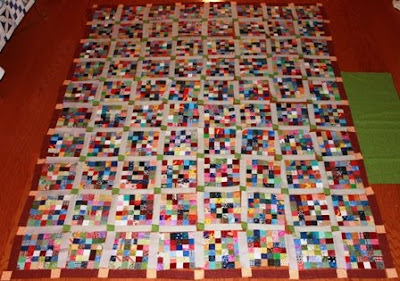 Must have used up all my virtuosity last year though, because this year the quilts on my UFO list have languished. Maybe I took care of all the really good UFOs last year, or maybe I have just been more distractable lately. Whatever the reason, it is October already and my UFO list seems to have gotten longer this year rather than shorter. 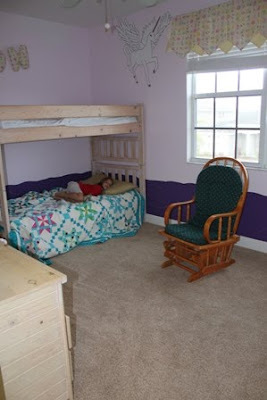 The new carpet is coming Tuesday (FINALLY) and the house is in a state of disarray. In the midst of the organizational transition I pulled out this project that was supposed to have fabulous striped borders. The string piecing went astray and I am going to just add a nice solid border to the edges and call it finished. I don't have anything in my stash that I think will work. I am thinking of something solidish in a darker color. 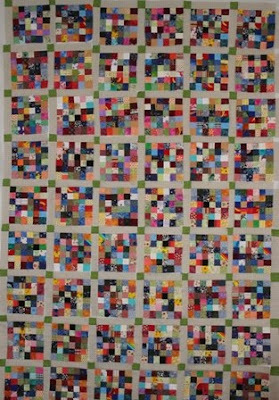 I see a lot of pink and orange in the quilt, but want to avoid anything excessively girlish. I'm thinking that red or lime green would work. A trip to the fabric store may be required. Until then I think I'll cut the failed border strips into some lovely string blocks for later. 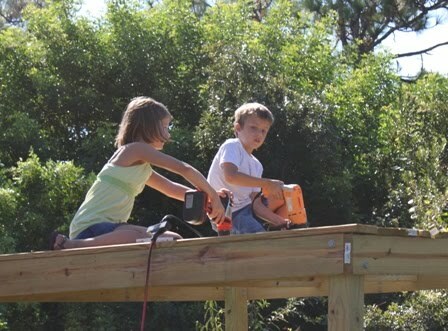 The kids have been outside off and on all day working on their new clubhouse. This is the same clubhouse that has already required a trip to the urgent care clinic for stitches. Both Anna and Ryan have invited friends over to join the fun. I'm keeping an eye on them in case medical care may be needed again. I'm hoping they all learned a lesson about tool safety last time. One of the best parts of the weekend is that big sigh of relief on Friday afternoon followed by the giddy thought of being able to pull out a project and work guilt free for a while. I've been volunteering in Anna's classroom on Fridays, doing hands on science. As soon as that was done, I headed home and started hunting for my weekend project. My midget blocks called to me, I still have that new paper piecing template I drafted for the last block that I want to try out. Yes, this is number one on the want to do list if not the should do list. My leader's and enders have gotten out of hand and need to be sorted and ironed and such. That wouldn't take long and would help things look a little less chaotic. Definitely on the list for the weekend, but maybe not first up. 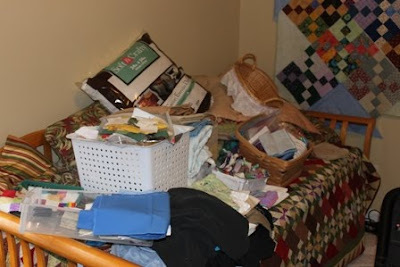 The bed has magically attracted lots of extra stuff; mending, fabric, all sorts of miscellaneous junk that seems to land here. This must be done before the new carpet shows up on Tuesday. Anna is really anxious for me to finish her quilt. It's going to take some thought tough, and it might be beyond the scope of my mental capabilities at the end of a long week. This scrap quilt has been hanging on the wall for a while now. It wouldn't take long to whip it together into a flimsy. Yes, that is the winner. 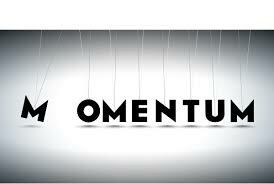 When in doubt, pick off the low lying fruit and grab the one ready for a quick finish. 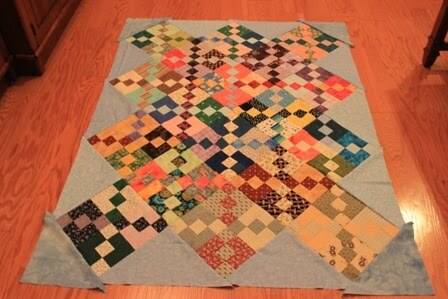 I've got two quilts put together into flimsies now that need to be ironed. I hope redbox has something good so that I can have a little ironing party tomorrow. After that I'm going to cross some more off of the ought to be done list.